by Wendy Chmielewski, Curator of the Swarthmore College Peace Collection. On September 13, 2015, the Pennsylvania Historical and Museum Commission unveiled a historic marker in nearby Rose Valley, PA to honor Mildred Scott Olmsted. Mildred Scott Olmsted, who lived most of her long life in Delaware County, was a leading figure in twentieth century social reform movements-women’s rights, civil rights, birth control, and especially the peace movement. Olmsted (1890-1990), was best remembered as the leading voice of the Women’s International League for Peace and Freedom in the U.S. for over forty years, leading that organization through the years of the creation of the United Nations, the Cold War, the civil rights movement, fears over the spread of Communism, protests against atomic weapons and civil defense, protests against the Vietnam war, and the rise of the women rights movement. As a young woman, fresh out of Smith College, in 1912, Mildred Scott entered the new field of social work. She volunteered with the YMCA, the Red Cross, and the American Friends Service Committee providing relief services in France and Germany in the aftermath of World War I Europe to assist in . The devastation and suffering she found in Europe convinced Mildred to become a life-long pacifist and active worker for the cause of peace. In 1922, Olmsted became Executive Secretary of the Pennsylvania Branch of the Women’s International League for Peace and Freedom (WILPF). 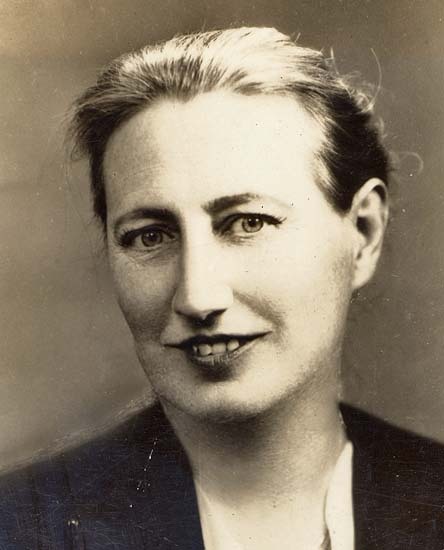 She assumed additional responsibilities in 1934 when she became National Organization Secretary of WILPF, U.S. Section. In 1946, Olmsted became National Administrative Secretary and she held that position until her “retirement” in 1966. She remained Executive Director Emerita of WILPF and was active almost to the very end of her life at 99. 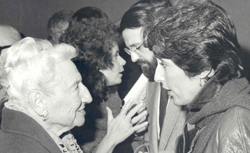 Olmsted with Joan Baez, about 1975. 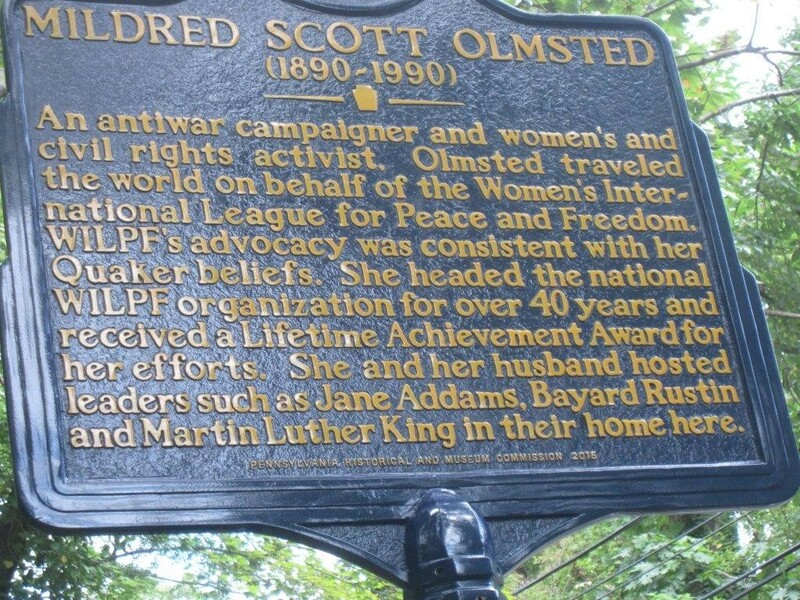 While she was best known for her leadership in WILPF, Mildred Scott Olmsted served many organizations. She was on the Board of Philadelphia SANE-against nuclear weapons, Promoting Enduring Peace, the Upland Institute of Crozer Seminary in Chester, Pennsylvania, vice-chairman of the Pennsylvania American Civil Liberties Union, and representative to the United Nations Council of Non-Governmental Organizations, among others. An early leader in the birth control movement, Olmsted helped set up the first clinic in the Philadelphia area. She championed the causes of women’s suffrage, civil liberties, the protection of animals, and conservation of natural resources. Her hobbies included gardening, travel, antiques, and historic preservation. In 1987 Swarthmore College presented Olmsted with an honorary doctorate degree, as several other institutions, including her alma mater Smith. She was honored on numerous occasions by WILPF and received its first Lifetime Achievement Award in 1986. Olmsted resided for most of her life in Rose Valley, Pennsylvania, a suburb of Philadelphia. She was a member of the Society of Friends and attended the Providence (Media, PA) Meeting where she served as clerk. She was a member of the Philadelphia Yearly Meeting Committee on Reorganization in 1973 and 1974 and also served on the Executive Committee of the Peace Education Committee of the American Friends Service Committee. The Mildred Scott Olmsted Papers and the Women’s International League for Peace and Freedom, U.S. Section Records are available at the Swarthmore College Peace Collection.